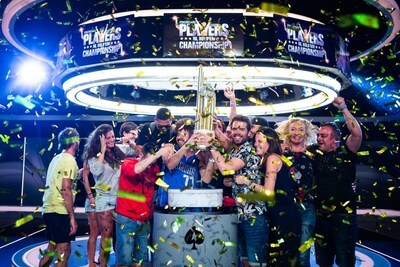 PokerStars (Nasdaq: TSG) (TSE: TSGI), the flagship poker brand of The Stars Group, announced today that Ramon Colillas from Barcelona, Spain, won $5.1 million and was crowned the winner of the PokerStars Players No-Limit Hold'em Championship (PSPC), the richest and biggest-ever $25,000 buy-in poker tournament. Colillas won free entry into the tournament as part of a PokerStars global promotion that awarded 320 people a $30,000 Platinum Pass package, which in addition to free entry, covered travel and hotel accommodations at the Atlantis Resort & Casino in the Bahamas. Colillas topped a field of 1,039 players that produced a record-breaking total prize pool of $26,455,500 and attracted players from all over the globe. As part of the total pool, PokerStars added an extra $1 million to the first-place prize. PokerStars awarded the 30-year old Spanish native a Platinum Pass after he topped the Campeonato de España de Poker leader board based upon his successful tournament play in a series of PokerStars-sponsored tournaments in Spain. The former fitness trainer converted to a professional poker player at the age of 24. "A lot of players were saying this was the most important tournament in history, so now it's only about happiness and enjoying the moment," Colillas said moments after his win. The runner-up was 26-year-old professional poker player Julien Martini from Paris, France, winning an impressive $2,974,000. Julien was a very composed contender and had attempted to win a Platinum Pass last year in the €1,100 EPT Barcelona National Event, just missing out on the Platinum Pass, but still winning €323,000 for coming in second. Platinum Pass winner Marc Rivera from The Philippines came in third place with $2,168,000. The 45-year-old won his ticket at the APPT Manila National Main Event with what was then his biggest live cash win. After being introduced to the game 12 years ago by his brother Ashley, who told Rivera he was "going to love it", the engineer (at the time) has been playing ever since. When not on the felt, Rivera enjoys basketball, watching TV series and spending time at home with his family, playing with his son and daughter. Not only has Colillas become a millionaire, but five other final table players have also joined the club. The eight-handed final table included US poker pro Scott Baumstein who started amassing live tournament cashes in 2009 and has accrued over $1.9 million in winnings over the past decade, Jason Koonce who had two reported live cashes worth a total $6,426, Marc Perrault who has had a string of hefty online and live cashes dating back to 2012, Farid Jattin, a regular fixture on the live tournament circuit across the United States and who is leading the Colombian all-time money list with over $2.9 million in winnings, and Talal Shakerchi, a businessman from London who has over $6 million in winnings to date. The players all took home cash winnings between $509,000 and $2.1 million for their efforts. 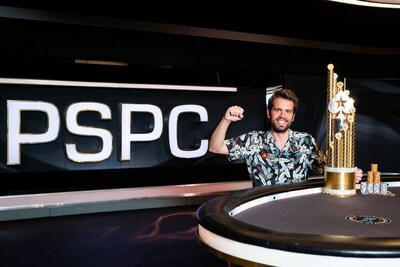 The PSPC made it into the history books with a total prize pool of $26,455,500 awarded to 181 players, smashing the previous $15,495,750 prize pool record for a $25,000 event. Of the Platinum Pass holders, 43 collectively cashed in for nearly $9.8 million, including Jacqueline Burkhart from the United States with $86,400, Atanas Pavlov from Bulgaria with $105,000 and Ireland'sSven McDermott with $69,100. PokerStars Director of Poker Marketing, Eric Hollreiser said, "We couldn't have scripted a better outcome for the tournament and PokerStars congratulates Ramon and all of the competitors for making this an historic event. Ramon's victory is a reminder that with a dream, some talent and a little luck, poker can change your life. We're proud to have created a special experience for more than a thousand players, but especially for those like Ramon who had never previously dreamed of playing in such a tournament." The poker fun doesn't stop despite the conclusion of the PSPC. The PokerStars Caribbean Adventure (PCA) continues with events including the $10,300 buy-in PCA Main Event, $25,000 buy-in PCA High Roller, $100,00 buy-in PCA Super High Roller and $1,100 PCA National. Live updates from the Super High Roller can be read on the PokerStars Blog now and will be live-streamed on PokerStars TV on January 11 and 12. To keep up to date with all live reports from the PCA visit the PokerStars Blog or watch the live stream daily from 12:30 ET and 13:30 ET on January 16 at PokerStars.TV. Find out more about Colillas' win on the PokerStars Blog. The Stars Group owns or licenses gaming and related consumer businesses and brands, including PokerStars, PokerStars Casino, BetStars, Full Tilt, Sky Bet, Sky Vegas, Sky Casino, Sky Bingo, Sky Poker and BetEasy as well as live poker tour and event brands, including the PokerStars Players No Limit Hold'em Championship, European Poker Tour, PokerStars Caribbean Adventure, Latin American Poker Tour, Asia Pacific Poker Tour, PokerStars Festival and PokerStars MEGASTACK. The Stars Group is one of the world's most licensed online gaming operators with its subsidiaries collectively holding licenses or approvals in 21 jurisdictions throughout the world, including in Europe, Australia, and the Americas.